The 10th matchday of the SG Table Football Premier League took place at the Sports Hub Library today. A total of 12 games were played today; and 2 games on 8 October and 1 game on 6 October. League leader Ouabi needs another 6 more points out of his remaining 5 games to clinch the 2014 SGTF Premier League title. 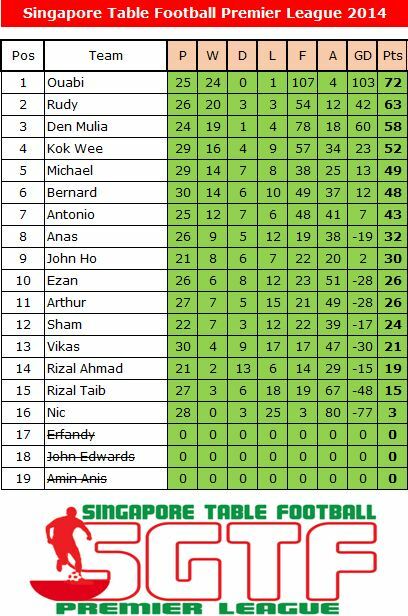 Key movements in the table include Rudy making his way to 2nd position overtaking Den Mulia, who did not play today. Kok Wee remained 4th while Michael displaced Bernard to take 5th position. Sham and Antonio also played out a thrilling game with Antonio prevailing 4-3! !